Simplify3D, from my experience and in my opinion, is the best slicing software that I’ve come across so far. It’s not free, but it is well worth it’s price. Simplify3D, not only does it have more capabilities than any other slicing software I’ve used, but it really is a very comprehensive program and it has a well done user interface. Hey, everyone. This is Tom on the WTFFF 3D Printing Podcast. Today, I’m going to continue another review on our series of reviews of slicing software. We’ve done a couple each of the last couple of months I think. We’ve done one, and this is the next one in the series. Today, I’m going to talk about Simplify3D. Simplify3D was not the first open source, or I guess non-proprietary is a better word, slicing software that I used in my desktop 3D printing experience. But it really is, from my experience and in my opinion, the best one that I’ve come across. There are still those I haven’t tried and we’re going to have some other reviews of other slicing software still coming up in the coming weeks and months. But of all that I’ve used, Simplify3D really is the best because it does some things that no other slicing software that I have found actually does. Let’s talk about that for a minute. The first slicing software I used was a proprietary one. The first non-proprietary one I used was Cura, which we talked about recently, which was originally made for the Ultimaker series of 3D printers but also works for many others. I have mentioned it in an earlier episode that when I purchased an Airwolf 3D printer, they actually, at that time, we’re standardized on Cura and that’s how I came to know Cura and started to use it. Later on, I actually got a copy of Simplify3D when I bought a Leapfrog 3D printer from Leapfrog in the Netherlands. It’s important also to note that Simplify3D is not a free program. There is a cost for it. If it doesn’t come with a 3D printer that you buy, I believe it’s around $149. 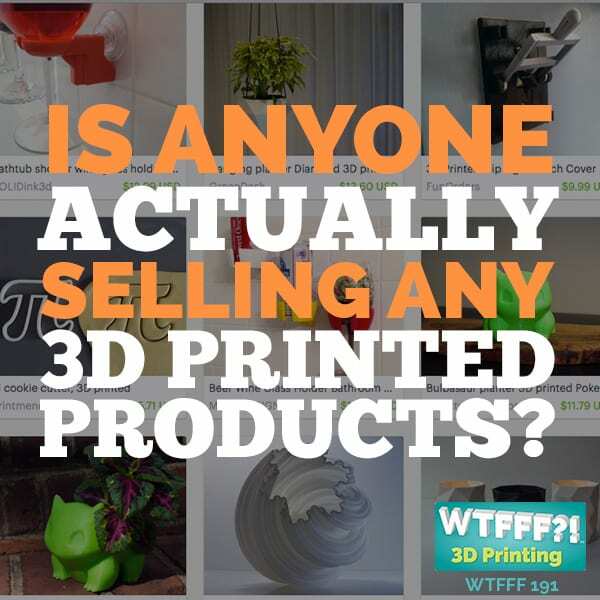 If you just want to buy it and use it and it didn’t come with your 3D printer, it will cost you a little bit for a license, whereas Cura is completely free and other slicing softwares, like Slic3r and things like that are also more open source and very free. Simplify3D, I found to be well worth the expense. There are just things that it does that I’ve not found any other slicing software does. 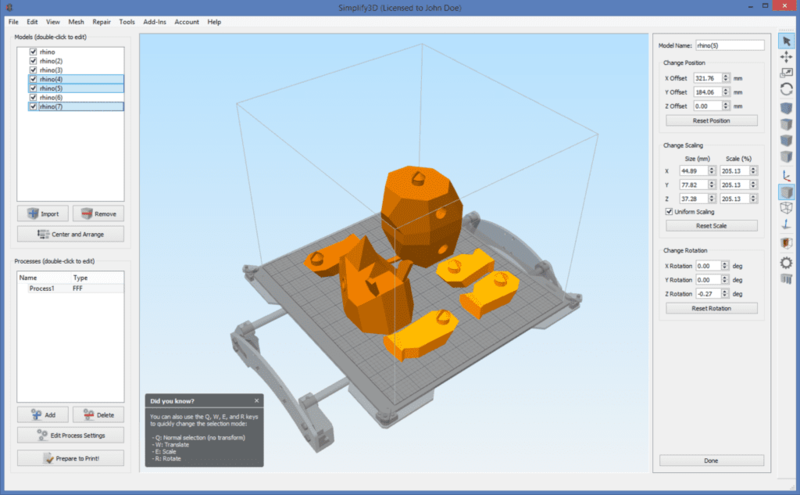 Simplify3D really is a very comprehensive program, it’s a well done user interface. Let’s talk about that. 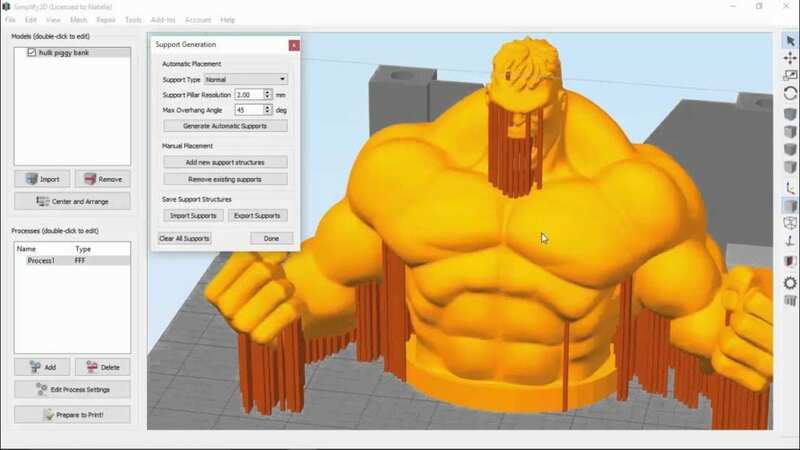 In Simplify3D, not only does it have more capabilities than any other, but it really is a very comprehensive program that it’s a well done user interface. It’s pretty easy to understand in terms of loading your STL files into it, manipulating them within there and then starting to create the different settings and features that you want your print to have. I’ll give you one example, a major one here, of what separates Simplify3D apart from others. They have what they called processes that you apply, either you’re going to apply multiple processes to one model or you can import multiple models, part of a multicolored print or just different models on the same build platform. You can apply different processes to each. What that means, what that process means, a process is a complete different set of settings. Let’s say you wanted to print part of a model in very, very thin layers and then another part of it in thicker layers because maybe part of it was a straight cylinder and there’s not a lot of unique features on there and you want to cruise through that print pretty quick. You want to go with thicker layers and just cruise through there and then when you get to some area that has finer detail, you want to slow it down. You want finer quality because you have some texture detail or some other purpose you want to go much thinner. You can just apply a different process to that region of the print. If you think about it, when let’s say you’re using two different colored materials in a print and you’re going to have one part of the print be red and another part of the print is going to be white. Let’s say your white filament, even though it’s the same material, whether they’re both PLA or both ABS, different colors affect filaments differently and they may not melt at quite the same temperature or they may need different retraction settings because the one oozes a little more than the other. Not all filaments are created equal. You can actually have different retraction settings for one process where you use one color and different retraction settings where you would use another process, but processes go beyond that. One of the things that has really frustrated me with a lot of slicing software that are out there, and this is true for both some of the proprietary ones I have used as well as the non-proprietary ones, is that they almost all allow you to reduce the speed of the very first layer. That’s a really good thing because your first layer is super critical. It’s the most critical layer. You want it to lay down really slowly and make sure you get a good bond to that build plate before you start going up with your next layers. I’m sure a lot of you who’ve worked with this have probably experienced the same thing I had where if I didn’t have just the right temperature and the right speed on that first layer, part way through the first layer the nozzle actually making a movement across the build plate can just knock and dislodge that whole first layer right off the build plate if you don’t have a good bond. Or if the material doesn’t stick very well because it’s moving too quickly then your next layer isn’t going to have anything to bond too. First layer, and of course this is well documented in desktop 3D printing 101 pretty much anywhere you would do your research, the first layer is super critical. What frustrates me is a lot of time most slicing software will make it so that you can reduce the first layer of the print but not any subsequent layers. You can reduce the speed of only that first layer. I don’t like that because a lot of times I’ve had several 3D printers where I really need to put a raft underneath my print. If you’re fortunate enough to have a heated bed on your 3D printer maybe you don’t need a raft as much because you can get adhesion because of that heat. But if you don’t have a heated bed, usually you’re going to need to lay down a raft. A raft is going to be several layers of material that are usually thicker and crisscrossed and create a sandwich grid structure that then becomes the foundation for the rest of the print. What’s always frustrated me is I could, with other slicing software, reduce the speed of that first layer of the raft but then when it starts printing the first layer of the actual object you want to print, it wouldn’t let you slow it down. It’s then cruising at the same speed that the rest of it is. That’s always very frustrating. It never made sense to me. It’s like, just like laying down that first layer of a raft, when you lay down that first layer of the actual object, especially if it’s got a lot of curve shapes to it, if it’s anything other than a basic rectangle or circle or square type of a shape, any other shape, you really do want to lay down that first layer of the object slower than all the rest. Because if you’ve got some curves, a lot of times you lay down the material and it skips. It doesn’t stick right where you want it to and it ends up creating, think of a circle if it was laying down on a circular shape or curve shape. It can end up stretching that material and creating a cord across that curve. Anyway, it just creates a mess and makes it so that the first layer of the object isn’t as good and clean as we need it to be and would expect it to be. With this processes with Simplify3D, you can not only choose an entire object to do a different process for but a section of an object. But with this processes with Simplify3D, you can not only choose an entire object to do a different process for but a section of an object. It gives you the control, if you’re going to use a raft, to slow down the first layer of the raft. But then you can do a process that starts at the very beginning of the part and slow it down as much as you want. Change the settings. Change the temperature see here now. Change the cooling fan properties. Anything that you need to in order to get that first layer on top of the raft to bond well and any subsequent layers. You can then have another process that’s for higher up in the print. You can completely define by Z height exactly how much of the print your process is going to affect. In any other slicing software, you cannot change settings of temperature, speed, retraction or pretty much anything within a single layer. Meaning, on a certain layer, let’s say you’re at layer 54 of a print, of the build plate. Let’s say you are printing a character that’s standing on two legs. At this point in the print, there still are two separate leg bodies. Maybe you’re at about just above the knee height of this print. You’ve got really two separate regions that are not connected that you are printing on the layer. Now in any other slicing software, whatever settings you choose that are printing the left leg are going to be the same for the right leg. It considers that as one layer, so even a program like Cura that allows you to tweak at Z, remember we talked about those plug-ins they have in that review a few weeks ago. You can change your speed, or you can change your retraction or your temperature, whatever. You can change things for a different levels of the print for different layers, but you can’t change something within one layer. In this example, in Cura, you would have to use the exact same settings for the left leg as you would for the right leg. Let’s say you’re printing, now you’re using Simplify3D, you’re printing this character and you’ve loaded each leg as a different STL file and maybe the torso is a different STL file. Maybe because you want to have different colors or materials print there, but you might have also wanted to do it because you might have loaded those legs as different models because you want to do different colors. But you also might have wanted to load the media as a different STL media so that you can treat them differently. The way it works with processes, you can either apply a process to a certain range of the model or models that you’re printing by vertical height or you can also choose, even as you’re printing on a one color machine but you are printing multiple STL files that are going to go together as one model, you can actually then choose different settings by different regions by selecting the different STL. You can apply processes to an entire STL or you can apply a process to a portion of an STL and actually you can apply multiple processes to each STL if you want or need to. Each different portion of the model. You can in Simplify3D. Let’s say the left leg has got some different detail on it than the right leg or the left leg, if you have a two color machine, is in red and the right leg is in white. The material flow properties are different and you want to choose different settings for those different regions. Simplify3D allows you to do that. You apply processes to the different models within a print and to the different vertical ranges of a print, whatever you want. Simplify3D figures it all out and creates each different layer to be whatever it needs to be. The G-code within that layer can change and can be faster over here than it is there. It can be hotter over here that it is there. You can have the fan on over here and not over there. That’s really the power of these processes. I hope this is coming across clear enough. If not, I apologize in advance, doing the best I can here on a podcast to explain things verbally. It really gives you a tremendous amount of control. I’ve really appreciated it, especially when I was working with two colored printers, like the Builder Dual and I did have a Leapfrog printer at one point that had two nozzles. This became really critical. They also have other functions. In Simplify3D, you can go through, as with most good slicing software, you can go through and affect everything from temperature, to speed of extrusion, to speed of movement, movement while it’s extruding, movement while it’s not extruding, going across the build plate somewhere. You can handle as many extruders or tools they call them in Simplify3D as you want. If you have a four color or five color printer, you can control that. Lots of different options and infill for different patterns. It can be recta-linear, it can be a grid or triangular honeycomb. There’s a couple of other versions of honeycomb, and even something called wiggle. You have a lot different infill options. Of course you can add G-code scripts if you need to to do whatever you might need to do. Let’s say you wanted to predictably pause a print at some point. You can add a script to do things like that. Or if you have a special movement you want at the end of the print. You can add starting scripts, layer change scripts, retraction scripts, tool change scripts, and ending scripts. It gives you a lot of options there. When it comes especially to multiple colors, you can use a prime pillar or an ooze shield. I’m not a huge fan of the ooze shield but some printers need it. If you’ve got more than one nozzle that are always at the same height, I think that’s a really important thing to use. Then you have options for raft or skirt and brim. In Simplify3D, you can actually generate support material automatically if you have a model that needs it. I want talk about support for a second. This is another very unique aspect of Simplify3D where you can actually generate support material automatically if you have a model that needs it. 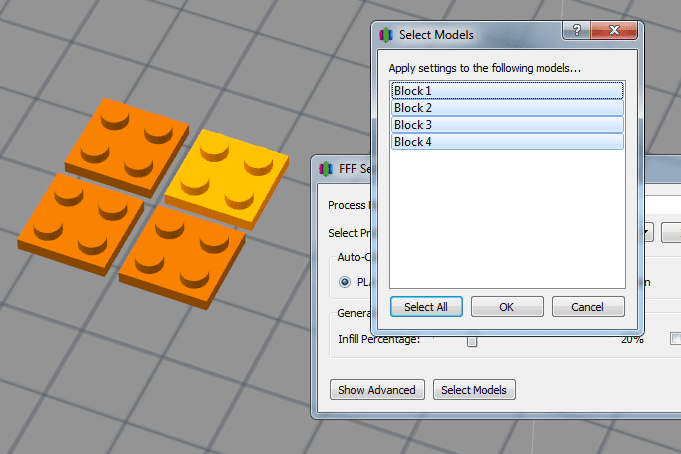 It also gives you an option to generate support only from the build plate to the object. Where that becomes really helpful is, let’s say you were going to print something that had a hollow section inside of it and really only a small opening. Let’s say you want to do a model of a bottle and that shape of the bottle, normally because of the angles, it would end up putting support material inside of a bottle. Think of a beer bottle or something. It’s got a very narrow opening at the very top. If you’re going to print that in a normal stand up orientation, sometimes those curves where the bottle is getting from the widest point in toward the narrower part of the neck of the beer bottle, it probably would want to put supports in there from inside the bottle, from the bottom there, up into that area that is moving in toward the neck. You wouldn’t be able to get in there and remove that support material. Simplify3D allows you to choose what’s sometimes referred to as a base support or support from the build plate only up to the object. It won’t generate any internally in an object unless you want it to, because you can turn that on and off. What’s even more useful and unique to this program is you can have it generate support. You can say, “If I were the software and I’m going through normal procedures and it’s going to generate automatic support,” you can have the computer generate that and you can see it visually. There are different ways Simplify3D will shade objects or color them, so there are some views where you can see that the support structures are one color and your good object is another color. It’s really easy to distinguish between them. Then you can decide. You can click on manual support. You can generate it first and then you can click on each little support pillar is what they call it, each vertical column that it’s going to create for support. You can define the dimensions of that column. It can be one mm square, two mm square. You can make them larger or smaller. You can click on each support column and delete them. Let’s say, “Oh, the machine wants to generate support in this area.” But you know from experience that that part of the print prints well enough for you and you don’t want to have to clean up any of the support material that doesn’t breakaway cleanly. You can delete support material, support pillars from certain areas. Then let’s say you end up deleting a bunch of them and you think you may be deleted one or two too many, you can add them back in. You just click a button, you’re going to add support, and it generates a column in a different color and it shows you where it’s going to go and you can just click and put it there. You can completely customize your own support. 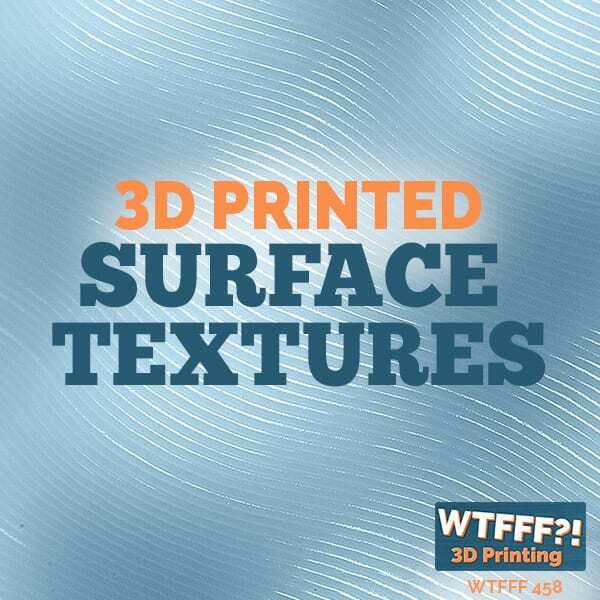 I have used this, and I’ve generated a lot of my own support material, especially for some of my own designs, like my 3D Printed Tie. There’s very, very little contact with the build plate, the way that design is. It’s very fine point. That’s okay when you’re doing those lower layers. But once you get up passed a centimeter or two off the build plate, the structures get heavy and it gets to the point where they’re on such a small contact surface with the build plate, they would topple over either their own weight or if the nozzle accidentally were to catch one of them and it’s not strong enough. I need some support material only up to a certain point. I don’t want it generated on my entire model because I don’t want to have to clean up all that breakaway support if it doesn’t I’ll breakaway cleanly. I only wanted it in just enough. I want enough to keep the model stable on the build plate but the whole thing would print cleanly without toppling over, or even under vibration from the machine, all the movements that are going on. I want enough to keep it from toppling over but I want the minimum amount possible. A lot of other software won’t do that. You either are turning on support or turning it off. Some do base support as an option as well, but that from the build plate up to the model support, again, they don’t give you choices of where you would use it for taking some of it away. The computer is just going to generate by its algorithm what it thinks it should do by certain rules. You can’t make exemptions to those rules. 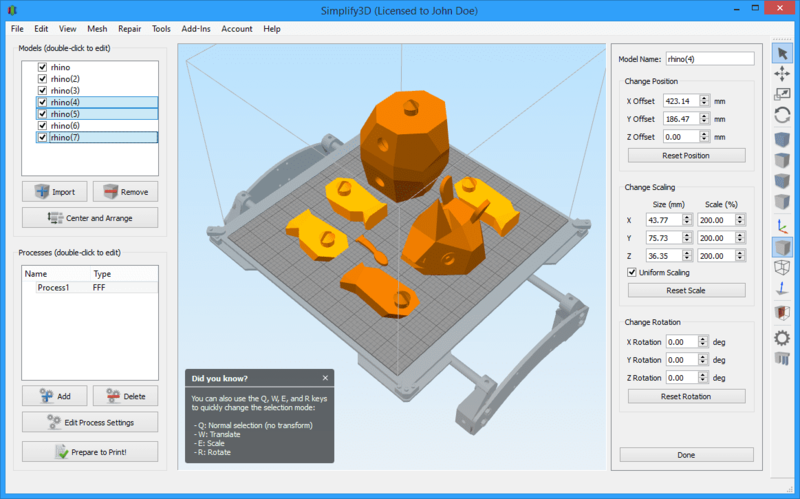 With Simplify3D, you can make exemptions to those rules. That is really one of the other incredible and best features. I’ve used it quite a bit. They have a good support forums, a lot of them are users. You can see if anybody else has a profile they’ve used for your printer. The other thing I want to share with you about Simplify3D is the support experience that I’ve had with the company. 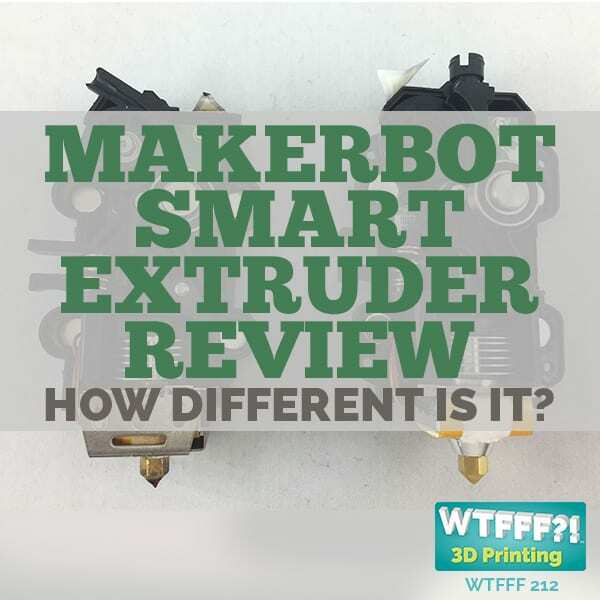 I have had 3D printers that I’ve used that I’ve bought and others that I’ve just reviewed where I used their software and I tried it out. I always tried it out the way the manufacturer intends. But, then I want to go a little further. I want to push the edge of the envelope and also use a program that I’m more familiar with. Simplify3D I am pretty familiar with because I’ve used it quite a bit. A lot of times, when I get a new printer, there is no existing profile for that printer in there. Now, like pretty much any slicing software works, you can manually configure the slicing software for the printer. 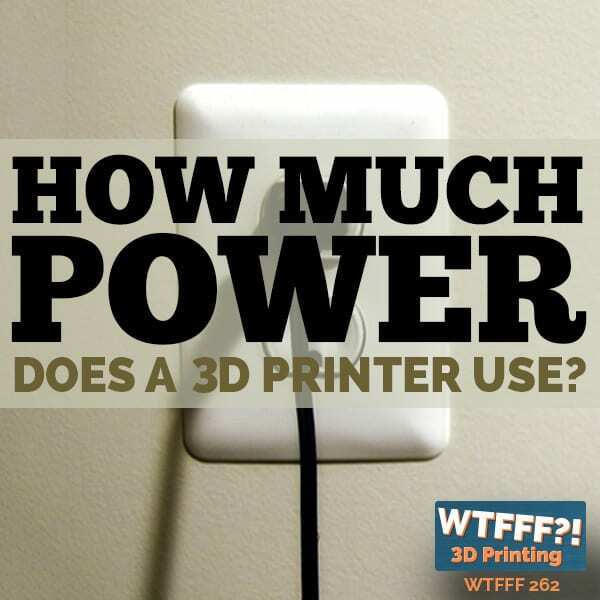 Is it a cartesian printer? Is it a delta printer? Or is it a polar printer, like Polar3D? You choose the type of printer it is, you answer a bunch of questions, fill out the information. How many nozzles does it have? What is the build volume? All these different criteria. Does it have a heated build plate, does it not? All these sorts of things. Then you can manually choose settings and slice a file to print and go ahead and print it. But I’ve had several printers where not only Simplify 3D not have a profile but I didn’t really want to go through that whole process of reinventing the wheel. They have a good support forums, a lot of them are users. You can check and see if anybody else has a profile they’ve used for your printer. But also I’ve just reached out to support. If it hasn’t been obvious in their knowledge base or support section on their website, I reached out to support and say, “Hey, guys. I’ve got this printer. Have you guys created a profile for that yet for anybody else?” Every time I have asked that question, the answer has been yes, they have and they happily emailed it to me then I go and use it. Or in one case, like in the case of the Builder Dual, they had a profile for the Builder Dual but their smaller version and not the larger version. The only difference between these two printers was the Z height of the build volume. I could take that profile and then enter the increased Z height and then I was good to go. I found their support staff to be very friendly, very helpful. Occasionally, I run into issues or problems. I wanted advice on how I could attack a certain part of a print and get it to work better and what had they experienced, what do they recommend. I’ve only had email conversations with them but they’ve been very detailed, very helpful and they respond in a timely manner. I’ve had a really good experience with them. I’ve also heard from some manufacturers who worked with them to give them information on their printer because they want their profile included in the next release of software, that they worked with them and they’ll add them on there. I’ve really been pleased with that in general. I want to also just give you a little information about the website at Simplify3D. You can download the software and do a free trial. You don’t have to buy it immediately. They have a pretty good website. There’s FAQ. There’s a lot of video tutorials. Even before you decide to use it or decide to buy it, I would recommend going through video tutorials. They have a bunch of support articles, what they call a quality guide. They have another guide to help you with hardware setup. They have a quick start guide and, of course their community where people post things up there with their experiences or post that they need help with something and then users help each other. That’s always a good thing. You can always contact support and just e-mail them and they’ll get back with you. I really don’t have anything bad to say about Simplify3D. Not that I ever want to say anything bad about a company or a product that we review. That’s not really my style. I tend to think that rather than there being a good or a bad, it’s more just what it is it a good fit for and what might it not be the best fit for. But Simplify3D, far as I have experienced, works with everything and it works really well. It’s pretty easy to use. I tend to like to print a file to an SD card or to a flash drive if the printer has that capability and it does that easily. You can connect it up directly with a printer as well. It will communicate directly if you want. That’s probably a pretty good run down on Simplify3D. They keep updating it. Actually, in preparation for this review, I just updated the latest version. The latest version is 3.1.1 on the Mac side. On the PC side, I don’t know if the numbers are the same. It’s been a while since I used it on PC. It’s available across platform. I highly recommend it, as long as you don’t mind paying a little bit for a good program. It’s a really good program. We have an interview coming up in a couple of days here this week with Brandon Davis of Blue Dragon. He was formerly with Leapfrog. He was the person that first introduced me to Simplify3D and highly recommended it. But I want to point something out. You’re got to want to listen to that interview on Thursday because Brandon started a new company, a little over a year ago. Blue Dragon has a new 3D printer that is a single nozzle quad, I think it takes four filaments into one nozzle. They’ve been working with different slicing programs over the development of this. 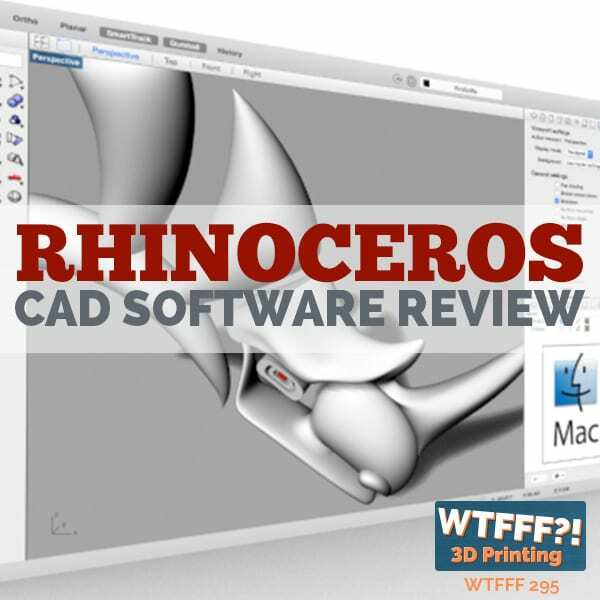 You’ll hear Brandon talk about how they’ve used them all, and they’ve actually come back to recommending to use Cura with their machine. You’ll be interested to learn more about that. I was interested to hear it when we did the interview because I still think Simplify3D is the best for me, but I have not used the Blue Dragon FirePrint is what they call it, their new printer, yet. Although he is sending one to us for a review in the coming weeks. I’ll get a chance to experience that with Simplify and with Cura, and obviously at that time, in that review, I’ll update information on what I think about those different slicing software as applied to that new 3D printer. Anyway, I think that a lot of times user preference has a lot to do with which slicing software you like and you get used to. It’s probably similar to CAD software. There’s not an absolute right or wrong answer but which one do you like for the style of your work. But even going beyond style just capability, I think Simplify3D has an edge over the competition. There you go. That’s my opinion and I’m sticking to it for now. 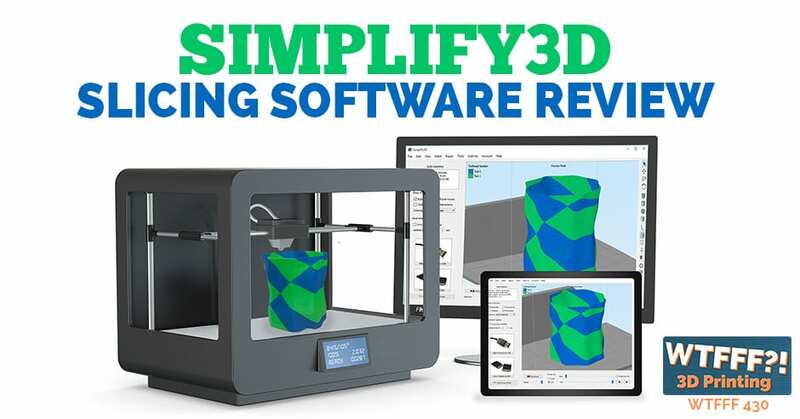 I’d love to hear what you have to say with your experience with Simplify3D or with any other slicing programs. What do you like and why? Why would use one over another? I’d be curious to hear that. You can leave a comment below or you can reach out to us anywhere on social media @3DStartPoint. We’ll be back tomorrow for our next episode. We look forward to talking to you then. Until then, this has been Tom on the WTFFF 3D Printing Podcast.